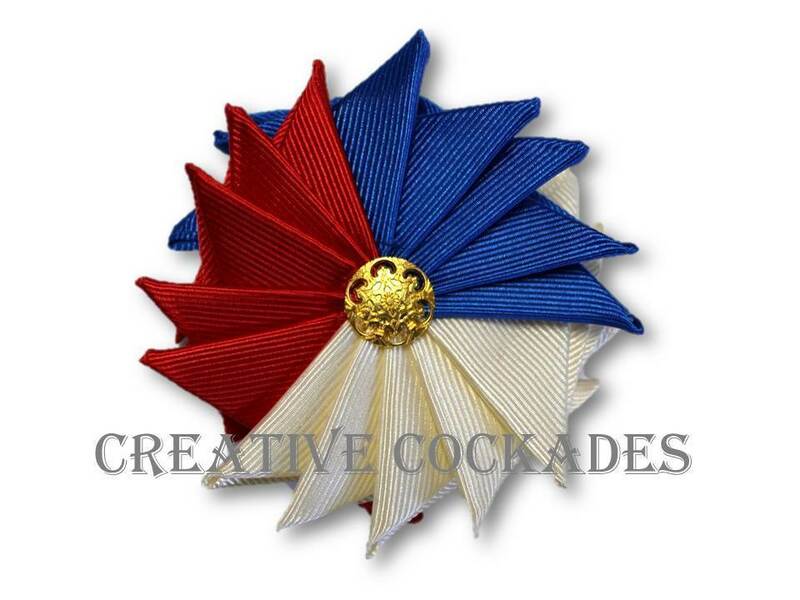 Based on James Monroe's cockade while Minister to France in 1790, this beautiful red, white and blue badge looks amazing on a hat or lapel. Dimensions: Approximately 3.5" (9 cm) across. Pin on back is silver-plated and 1" (2.5 cm) wide. Shortly after the Bastille fell, the tri-color cockade became the symbol of the French Revolution and later of the Republic. It combined red and blue, the colors of Paris, with the French royal color of white. At the time that James Monroe was America's ambassador to France, the American cockade was still black. However, to show his support for the French Revolution, Monroe wore this tricolor cockade. Eventually the tricolor came to America and took the place of the American black cockade. Now both countries wear red, white and blue to be patriotic!